Synthetic peptide corresponding to Human Histone H3 aa 100 to the C-terminus. 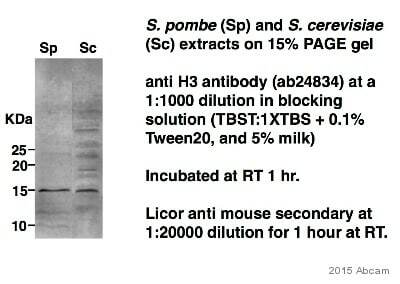 This antibody gave a positive signal in the following lysates: HeLa Histone Preparation; NIH3T3 whole cell; PC12 whole cell; Mouse Testis Tissue; Rat Testis Tissue. This antibody gave a positive result in IHC in the following FFPE tissue: Human normal skin. Our Abpromise guarantee covers the use of ab24834 in the following tested applications. WB Use a concentration of 0.5 - 1 µg/ml. 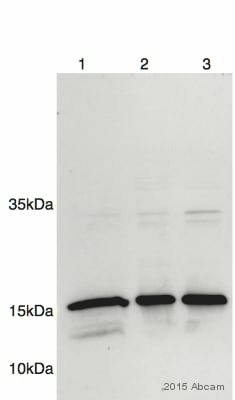 Detects a band of approximately 18 kDa (predicted molecular weight: 15 kDa).Can be blocked with Human Histone H3 peptide (ab12149). Chromatin was prepared from HeLa cells according to the Abcam X-ChIP protocol. Cells were fixed with formaldehyde for 10 minutes. 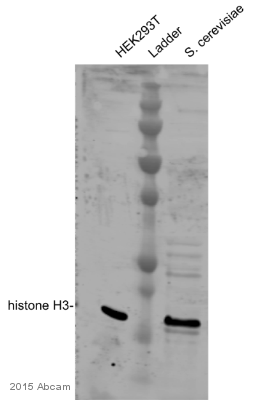 The ChIP was performed with 25µg of chromatin, 5µg of ab24834 (blue), and 20µl of Protein A/G sepharose beads. No antibody was added to the beads control (yellow). The immunoprecipitated DNA was quantified by real time PCR (Taqman approach for active and inactive loci, Sybr green approach for heterochromatic loci). Primers and probes are located in the first kb of the transcribed region. Publishing research using ab24834? Please let us know so that we can cite the reference in this datasheet. I have a question for a project we are initiating requiring lots of different antibodies. This is a clinical diagnostics projects, and all antibodies we will use for that need to be CE certified for diagnostic purposes. All of our products are for research purposes only and are not certified for clinical research applications.